Where Do We Go From Here Is Here! Some of you may know that I have been working on a novella with fellow author Mario D. King. Well, “Where Do We Go From Here” is now available on Amazon.com for only .99. 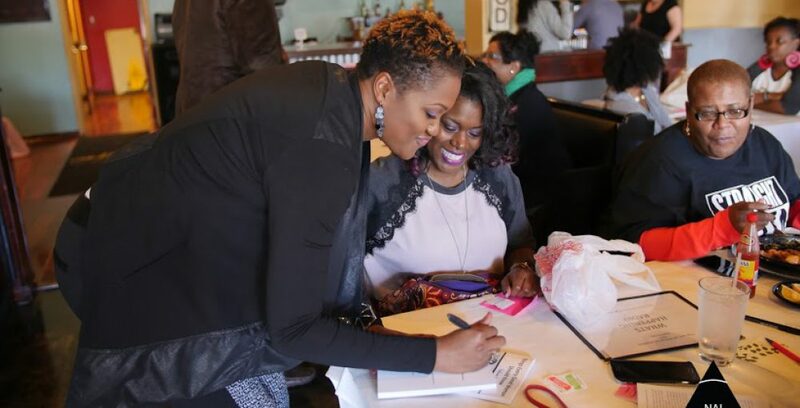 Last year, a startling statistic was released that 72% of African American babies were born to unwed mothers. Mario and I wondered what would become of those babies? What type of environment were they conceived in and what type of environment would they be raised in? How can we tell their story? What evolved was a lustfully exciting tale that examines what can happen when two people intertwine their lives and their bodies with no intention of creating a future together. This novella is entertaining encouragement to make wise decisions in our relationships/interactions because sometimes our actions have life-altering consequences. I must warn you that this is not one of my usual Christian offerings but it still has an inspirational message we felt must be told. Read more about it here. Within 24 hours of the book being released, we received out first review from fellow author Derrick L. Randall. I could not and desired not stop reading until I finished. An absolutely rich and engaging read, Where Do We Go From Here, is dynamically relatable. It is a profound tale of the importance of individual, relationship, and cultural choices. It embodies twists and turns right out of the reader’s personal and unspoken experiences. As a writer, I am inspired to write. As a reader, I am excitedly awaiting the story to continue. As a self-proclaimed 2k15 “Hippie”, I am sho’nuff groovy now. It was exactly what I needed. We’d love for you to read it and tell us what you think. Download the book here. Be sure to like our Facebook page. We are going to do some great giveaways there in the near future. BONUS: Read the first three chapters! The story I have chosen to share is What Goes Around Comes Around. Click the title to enjoy! The book is available in paperback and Kindle on Amazon.com but you can also get an autographed copy from me! 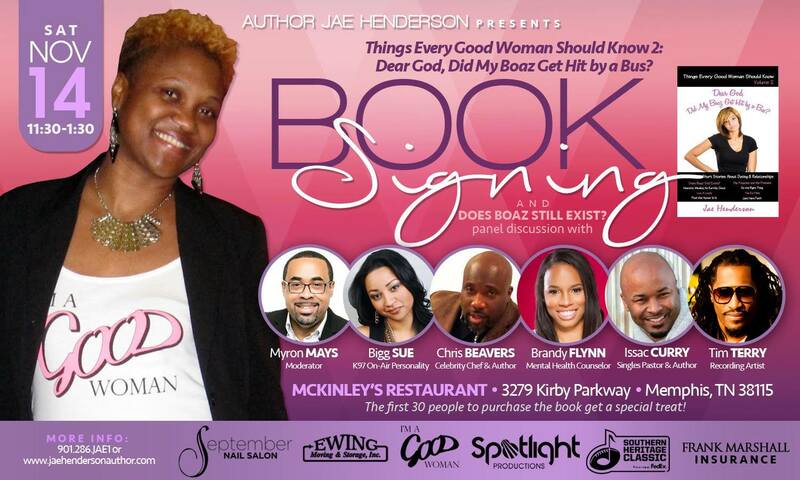 Also, my first book signing is in Memphis on November 14th. If you are out this way, I’d love to see you! 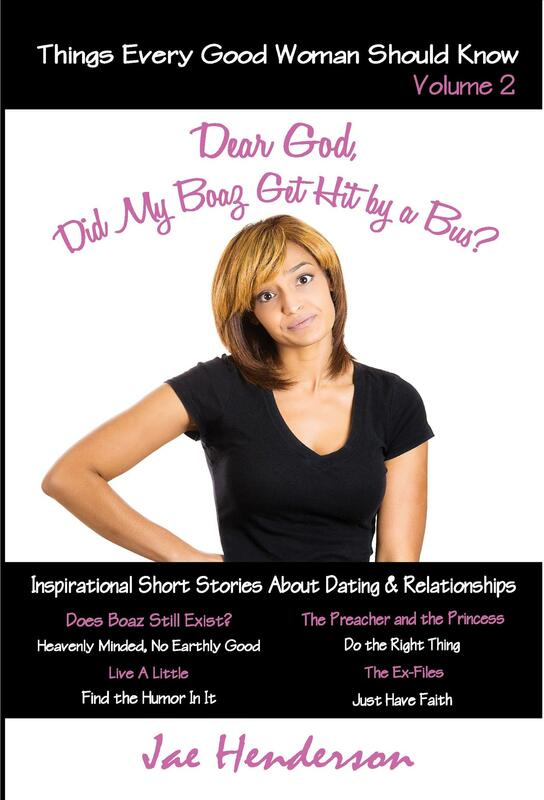 I am proud to announce that my latest book “Things Every Good Woman Should Know Volume 2: Dear God, Did My Boaz Get Hit by a Bus?” is finished and available for you to order directly from me which means your copy will be autographed. The cost is $10.00 plus $3.00 for shipping and handling. Women of all ages can appreciate these faith-filled examples of love, relationships and the single struggle. Sometimes you want to laugh and sometimes you want to cry, but one thing you won’t want to do is put this book down. Order your copy today! The Kindle version will be available very soon and you will also be able to order it on Amazon.com. I’ve been contemplating what to do with this blog. I want it to be more than a “look at what I’m doing page”. I’ve decided to make this the home of my singles blog. It used to reside at http://www.mysideofthesinglelife.com but I haven’t posted there in months. Soooo without further ado, allow me to encourage you through your single journey. In my past, I only consulted God when my relationships weren’t going well. I figured if things were good God must have sent him so all I needed to do was enjoy His blessing. I was so wrong. I found out the hard way that I should consult Him in the beginning before things even developed into a relationship. It saves a lot of time and heartache. Now, when I meet a guy that I think I might be compatible with I ask God to reveal to me the things I need to know. Yes, it’s that simple. I know some women who say they ask that if he doesn’t need to be in their lives that God would just remove him. Well, my inquisitive nature wants to know why he doesn’t need to be in my life. If I know that, there is far less of a chance of me letting him back in my life if he attempts to return. I asked God for divine revelation in my last relationship after I kept receiving signs that something wasn’t right and the next day, my boyfriend’s other girlfriend called me. I recently did it again after meeting with a gentleman I had been talking to for weeks on the phone. We live in different cities and we’d hung out before but during our absence from one another our conversation became more serious and the possibility of a relationship was discussed. When I saw him again, God revealed to me that he is quite rude and possibly a little slow. No, my statement is not nice or politically correct and probably not very Christian-like but neither was his behavior. I do not wish to go into detail but believe me when I say the things he said and did were deal breakers for me. Considering that neither of us has called the other since we went out, it’s safe to assume that the “this isn’t going to work” feeling was mutual. I’m completely fine with that. The only problem is that after God does exactly what I ask him to do, I’m disappointed rather than rejoicing that it was revealed that the gentleman in question could not sow positive seeds into my life. Just like everyone else, I get tired of the dating game. I get tired of meeting someone new and developing a sense of optimism about what could transpire between us only to discover that we are not compatible. However, I have to put things in their proper perspective. I’d rather waste a few weeks on a guy than months or years. I’m working on developing a better spirit of gratitude. 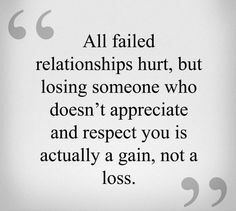 Instead of thinking “another one bites the dust” I should be thinking, “Thank God, he’s gone.” This is going to be a process because I have to retrain my way of thinking. No one likes failed courtships but I’d rather have that than a failed long-term relationship or marriage. THANK YOU GOD FOR DIVINE REVELATION!